Gatlinburg, TN is unlike anywhere else in the world! Situated at the foot of the Great Smoky Mountains, our charming city offers stunning natural beauty and a variety of fantastic family-friendly attractions. When you stay at Old Creek Lodge, you will have the perfect home base for exploring the heart of Gatlinburg. Modeled after a traditional mountain lodge, our hotel boasts a 4 ½ star average on TripAdvisor. To help you plan your next vacation, we have put together a guide to the top five things guests love about staying at our downtown Gatlinburg hotel. 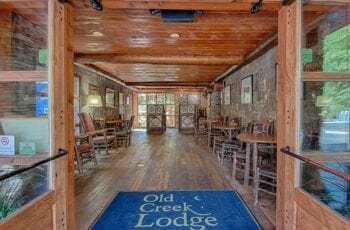 While Old Creek Lodge is near all of the fun in the center of town, it is far enough away from The Strip to avoid the hustle and bustle of the downtown area. With our peaceful atmosphere and proximity to the Parkway, our downtown Gatlinburg hotel truly offers the best of both worlds. All of the rooms at Old Creek Lodge feature private balconies that overlook an idyllic mountain stream. Our guests love to sit outside and enjoy the soothing sights and sounds of the water below. Your room’s balcony is also perfect for watching the sunset, especially when you share a glass of wine or sparkling cider with your sweetheart! Each day at Old Creek Lodge begins with a complimentary breakfast. Guests will find a variety of cold breakfast items, from a yogurt bar with a selection of toppings, to a variety of cereals. Having breakfast right at our hotel is a great way to save time and money. Rather than waiting in line at one of the restaurants in town, you can grab a quick and tasty meal with us and start your adventures for the day! 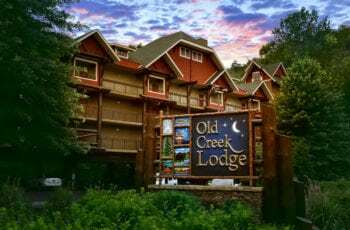 Old Creek Lodge is not your typical cookie-cutter chain hotel. True to our roots, we offer a unique Appalachian atmosphere that is perfect for a Smoky Mountain vacation. Our rooms feature beautiful hardwood floors and toasty fireplaces where you can unwind after a full day of fun in town. Although our lodge is full of old-fashioned charm, it also boasts a variety of state of the art amenities, including free WiFi, LCD TVs, tile showers, and an outdoor heated pool. Here at Old Creek Lodge, we only hire the best! Our staff members are some of the friendliest people you’ll ever meet. If you’re in need of recommendations for places to eat or things to do in the area, our team members are always happy to share their favorite restaurants and attractions. Ready to start planning your getaway? Browse our selection of downtown Gatlinburg hotel rooms!